The Kountry KitchenAnd have lunch at:The KoffeeKoveIt makes my skin crawl! Not kool or klever. But that's just me. Don't Leave the North Country Without One! "1/2 ham and provolone cheese on white, mayonnaise-Russian-and-oil, everything but pickles, hot peppers, and shakers." Last night Annalisse told us what causes a stomach ache: stomach asses. Another Annalisse-ism is born. Last night we had a chance to spend some quality time with Jackson. It was only about two hours, and he slept for half of it, but it was still fun. It reminded me of the demands of a baby, especially since we were relative strangers (no pun intended) and I wasn't sure if he was hungry, tired or just plain upset about being in a strange setting. After a fussy dinner of mashed bananas and avocados, we high-tailed it out for a walk in the stroller as a distraction. We made our way down the street and he was asleep by the fourth house. That sort of put an end to our plans of introducing him to the baby ice cream cone (vanilla custard) at Moonlight Creamery. He headed back to Popo's about 7:30pm, a very tired boy - it's got to be tough still struggling with the seven-hour time difference. The "big kids" loved taking care of him and fussing over him, and we will miss him when he's gone!! Here's a picture of our nephew, Jackson, who is almost 8 months old. We met him for the first time this weekend. He is so sweet and very jolly. Wasn't he worth the wait?! Yesterday, Jasper and Mercy recreated Michangelo's famous painting, God Giving Life to Adam, as seen on the ceiling of the Sistine Chapel. I'm not sure which one is playing "God" and which is "Adam." It's about time we got an updated version. Friday: Work, anniversary lunch, shopping for ingredients for a couple of salads and supplies for a picnic at our house on Saturday, dog walk, and pick up relatives arriving from Turkey at 10:20pm. Bedtime at 11:30. Saturday: Up early, go to the market, make salads, clean, greet visitors, have fun at picnic, clean up, go to Okoberfest with neighbors, walk dog, collapse into bed. Sunday: Up early again, go to church by 7:45am to set up coffee hour, take dog to field, go to dim sum at noon, go to the People to People reunion meeting at 2pm, go shoe shopping, walk down to McCardles for a light dinner. If we're mulching, it must be summer! With blatant disregard for the fact that fall arrives next week, a couple of weeks ago we ordered mulch for our beds and gardens. I know it's late, but somehow the summer passed us by and we finally got around to working on the yard a little more (beyond the incessant weeding caused by a lot of rain this summer). My other goal for this year's yard was to outline the beds with field stones. We were lucky to connect with a lady at the dog field who just happened to be getting rid of a lot of stones (she was reconfiguring the gardens around her yard), so after a couple of trips to her place we are almost done! Between the fresh mulch and the big rocks everything looks really nice and very tidy. We still have a lot to do in the back yard, including the herb garden, but at least the front is done. I find a beautiful lawn really satisfying. I must be an adult now. Mom: "What did you do?" Mom: "Do you have homework?" Mom: "Okay, I'll talk to you later." On Friday we'll finally meet our new cousin, Jackson, as he returns to the states for a three-week visit. We'll only see him for a week before he jets off to California for a visit with his relatives there, but we're looking forward to spending time with him and doting on him a little. Amazingly, he's almost 9 months old already. Mom, who's spending the year with him in Turkey, keeps us up-to-date on his progress and unabiding cuteness, so, while he'll be meeting us for the first time, it seems like we know him already. What a well-travelled kid! Time to get up! Get dressed! C'mon, get moving! What's for breakfast? Are you buying or bringing? It's too cold to wear that! Brush your teeth! Do you have all your stuff? One out the door by 6:40am. Did you take the dog out? Feed the cat! Okay, let's finish reading that chapter! Pick up your breakfast dishes! Second one out the door by 7:15am. Having them make their beds in the morning has become an unrealistic fantasy. Last night we got around to getting a new vacuum cleaner. We ended up with a Dyson DC14 which was a little on the pricey side but, based on Baker Blog reader feedback, worth it. We haven't had a chance to give the whole house the once-over, but the picture at the right is the result of vacuuming the dining room alone. Of course, Jasper came running when he heard the vacuum cleaner hoping to get a vacuum massage. Last night under balmy late-summer skies, we had our Fourth Avenue picnic. It wasn't a hootenanny with singing or anything (but don't you love that word? ), but there was definitely a positive vibe as neighbors enjoyed each other's company (not to mention each other's culinary treasures and baked goods). The party started about 6pm with the closing of the streets, and the kids were out of control (in a good way) riding their bikes and running wild up and down the street and through the lawns. After we cleaned up, we headed to the Nune's for a patio bonfire. Admittedly, all that was missing was an acoustic guitar and a rousing medley of Beatles songs. And so we say goodbye to summer for another year. It's finally here!! The first day of school! The kids are easing in with just two days this week, but that's enough to whip Annalisse into a frenzy of excitement, and to get Cameron to "sorta" act like he's interested in going back to school. 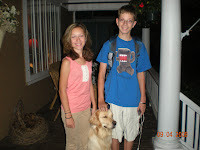 It's off to the high school for Cameron (10th grade - he left in the dark at around 6:30am), and this year Annalisse will "rule the school" as an eighth grader. So off they go - it will be June before we know it! The dog will sure be bored with them gone.